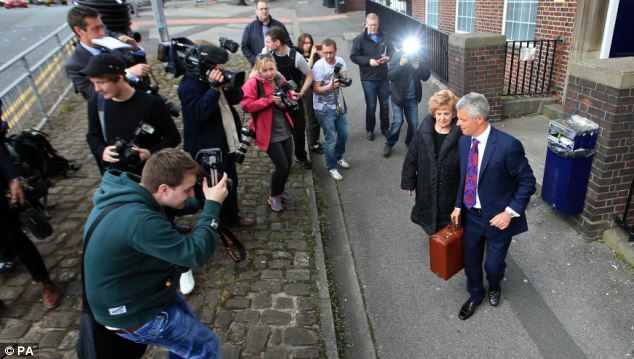 Coronation Street actress Barbara Knox has claimed she was 'manhandled' by police after her arrest for drink driving, a court heard yesterday. 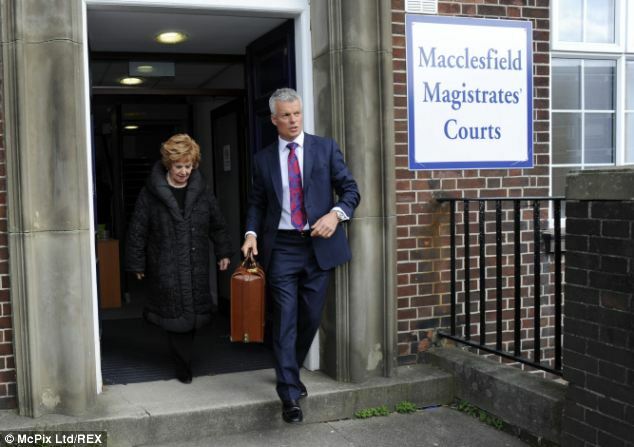 Mrs Knox - who plays the role of Rita Tanner in the ITV soap - entered a not guilty plea at Macclesfield Magistrates' Court, in relation to an incident in Knutsford, Cheshire, on March 10. 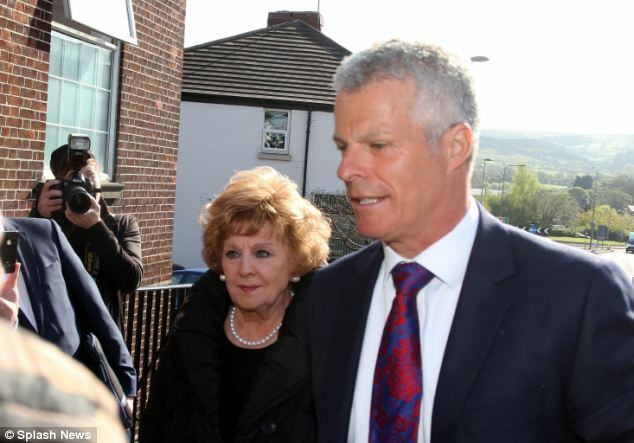 She arrived at the court, dressed in a black quilted coat and pearls, with Nick Freeman, a lawyer who has represented a slew of celebrities charged with traffic offences, including David Beckham, Jimmy Carr and Jeremy Clarkson. Mr Freeman, who is reported to be one of the country's highest paid solicitors, has been nicknamed 'Mr Loophole' by the tabloid press because of his success in motoring cases. It's a moniker he trademarked in 2008. The 80-year-old Mrs Knox, who suffers from high-blood pressure and hearing difficulties, also claimed that police 'physically manhandled' her. Mrs Knox was said to have been a passenger in a Jaguar driven by her daughter, Maxine Ashcroft, 56. The car was stopped by police after a member of the public reported they thought the driver was under the influence of alcohol. Ashcroft was found to be nearly three times over the legal limit when she gave a breathalyser reading at Middlewich police station. Mrs Knox, from Knutsford, later arrived at another station and was arrested herself on suspicion of drink driving. She was bailed pending further inquiries until she too was charged on April 4. Prosecutor Simon Pover explained: 'Police officers initially dealt with an incident where the driver of the Jaguar was found to be over the limit and was dealt with. 'A passenger in the car, Mrs Knox, was assisted at the roadside by police officers who were concerned to leave her alone. They drove her home to an address in Knutsford. 'About an hour later Mrs Knox attended Knutsford Police Station and appeared to still be intoxicated. 'Police officers were concerned about how she arrived at the police station and gave her advice about how she should return home, and offered to give her a lift home but she declined. 'She was then seen to get into and drive a Jaguar motor car a short distance - police stopped the motor car and spoke to Mrs Knox. The blood contained 85 microgrammes of alcohol in 100 millilitres of blood, with is fractionally over the limit of 80 microgrammes. She has been granted unconditional bail until her trial, which will again take place at Macclesfield Magistrates' Court. Ashcroft, from Lechlade, Gloucestershire, was banned from driving for two years in a hearing at Macclesfield Magistrates' Court earlier this month. Mrs Knox left school at 15 and worked as a telegraphist in the Post Office before appearing in amateur theatre. 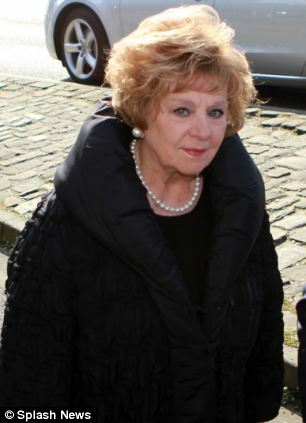 She first appeared in Coronation Street in 1964 for one episode before becoming a regular character in 1972, winning a TV Times best actress award in 1989, and a Lifetime Achievement honour at the British Soap Awards in 2004. She was also made an MBE in 2010 for her services to drama and describes her hobbies as gardening and tapestry. She has been married twice- first to Denis Mullaney in 1956, having three children John, Amanda and Maxine. The couple later divorced in 1977 when she married John Knox. She and Mr Knox then divorced in 1994.